Keya Curtis walks into the YWCA of Greater Cincinnati lobby and greets the receptionist with a warm smile. She’s there to teach a weekly Project CARE STARR class, which helps women with disabilities learn about healthy relationships, personal rights and empowerment. In a way, Curtis, 38, has come full circle. She participated in one of the pilot STARR classes in 2015 after battling a drug problem and losing custody of her children. She’s been diagnosed with a mild intellectual disability, bipolar disorder and depression, and was a victim of abuse and neglect when she was a child. Curtis credits the STARR class with helping turn her life around and overcoming past trauma. “People can change,” she said. In August 2016 she was hired as a Project CARE self-advocate, thanks to a grant funded by the U.S. Department of Justice’s Office on Violence Against Women. 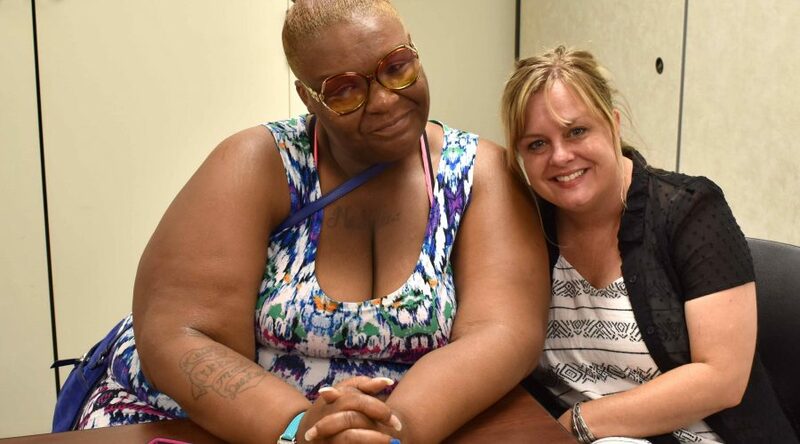 Most weeks Curtis is at agencies around the city, like the YWCA and Greater Cincinnati Behavioral Health, supporting others by listening and sharing her story. These opportunities are important because service providers don’t always have time to focus on self-empowerment skills for people with disabilities, said Holly Watson, Project CARE manager for the YWCA. Working with advocates like Curtis and talking about issues with peers can make a real difference in someone’s life. Past experiences give Curtis insight into how to support other women. Despite her troubles, her grandmother and a woman she calls Miss Mary, who she met while living in a group home, always believed in her and told her she would be a success story. Recently Curtis moved out of Winton Terrace and into her own apartment near one of her sisters, who is taking care of her children. Her dream is to one day operate her own group home, similar to where she lived for 10 years. “People out here want to be treated like they have a home and a family and feel comfortable in life,” she said. Keya’s story originally appeared on our website November 8, 2017 as part of our series highlighting people we support giving back to their community. See more stories like this here.